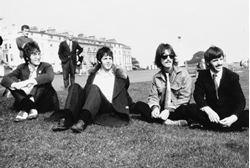 The Beatles' struggle to finish “The White Album”: How bad did it get? . Beatles Radio: The Beatles, Solos, Covers, Birthdays, News The Fab 4 and More! The Beatles' struggle to finish “The White Album”: How bad did it get? As the summer of 1968 wore on, George Martin and the bandmates logged increasingly long hours in the studio. Paul McCartney had debuted a new, playful composition called “Ob-La-Di, Ob-La-Da.” Of all the songs that they would attempt that summer, “Ob-La-Di, Ob-La-Da” revealed the inherent limitations of the group’s painstaking rehearsal and recording practices. Over the ensuing days, the new song would be the subject of successive remakes as McCartney and the other Beatles made marginal strides toward capturing his vision for the song. By July 5, Paul attempted a reggae version of the song, with George hastily recruiting a trio of saxophonists and a bongo player for the session. Seemingly mad for effect, Paul asked for a piccolo superimposition later that same evening, only to wipe it from the mix shortly thereafter. Before the session was out, the Beatle had replaced the woodwind instrument with a guitar overdub.